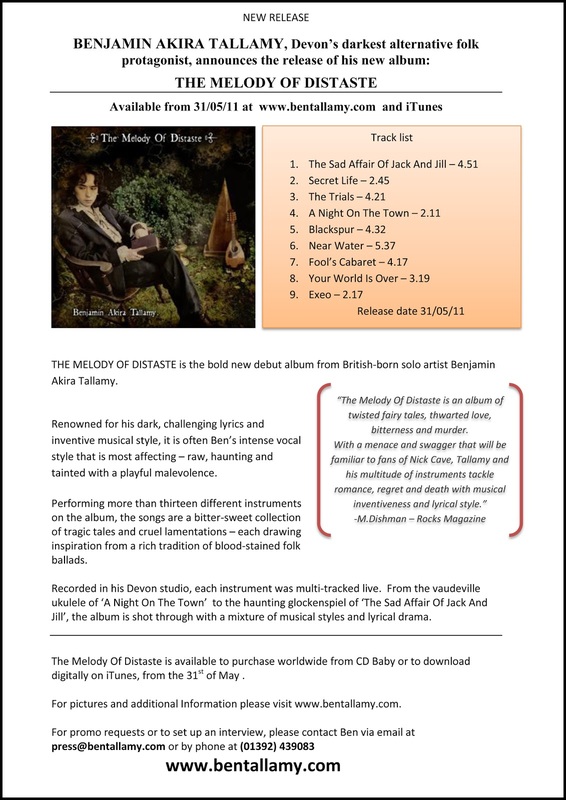 When I set out to do a one-sheet for my album, i didn’t really know what it should look like. There are countless ‘tutorials’ out there, but what I really wanted was an example of an actual one sheet. Unlike many of the other tutorials, I’ll show you the one sheet I used, explain the reasoning for it’s layout and link to anything that may be useful. I’ll also not ask for any money, unlike those other tutorials that I won’t stoop to name. I used Word to do my press release but you’d have a better time with a program like Adobe InDesign. 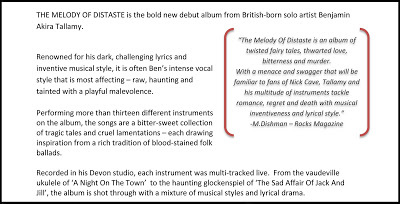 The product I was writing about was my solo album The Melody Of Distaste. Now I was fortunate enough to have a few patient and kind friends who had seen one sheets before, and thanks to their advice, I was able to pull a pretty good press release together. The most important thing I learned along the way was that basically, you want to tell the reader what you want them to write. In the busy world of journalism, no one wants to fish about for information. Have a good, clear header that not only sums up the release but can also be used as a direct sound byte that they can use, should they wish to do so. More often than not, you will see your own words being directly used to describe your own product – so make it a good tagline! As you can see, I’ve made sure that a quick breakdown of all the important info is right at the top. In this case my main points are – I’m releasing an album – it’s great – when it’s out – where to get it. I’ve capitalised the album title and my name just to drive it into peoples subconscious. Technically I’m doing this right now. Some would say this whole article is a shameless attempt to link to my music, but hey ho. Next up I popped a photo of the album’s cover along with a tracklist. This is optional, as the people reading your press release will probably have a copy of your album anyway. 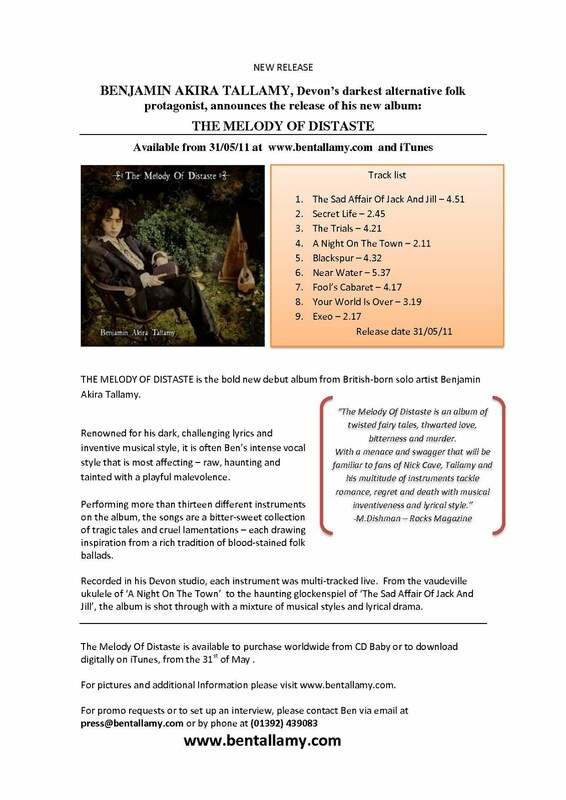 I used the press release to submit demos to radio stations too, so I made sure to include the length of songs was included here too. A press release has to be eye catching and so it’s a good idea to try and break up any big chunks of text wherever you can. Try and imagine you’re an underpaid journalist, who would rather be anywhere but in an office, on a Monday morning, reading your press release. If it looks like you’ve transcribed a portion of the English patient onto a side of A4, you can imagine how unwilling anyone would be to read it. If you haven’t read the English Patient then just remove all the furniture from one of the rooms of your house and spend about twelve hours staring at a bare wall. That should give you a similar experience. Here is the meat and potatoes of the one sheet – the blurb. to be honest, I imagined that 70% of the readers wouldn’t bother getting this far unless they were interested (much like this blog post). By this part of the press release, you want to have already given all the information that is important. This is your chance to just sell a few more sound bytes. Try and think of a few things that could feed an interview or article should it follow – any interesting facts about the project or the people involved. It is always good to write from the perspective of a third person and make sure not to overdo how much you big thing up. No one likes an egotist! I broke the blurb into paragraphs which i felt could also stand alone sound bytes, name-dropping the odd track and using a few chose words to steer the tone of the description in the direction I felt would benefit it. I also had a lovely little quote which conveniently mentioned some of my favourite artists, in the vain hope that I too may get mentioned in the same breath. Remember to tweak the tone to suit different targets. If you’re of local interest, you may want to big that up when sending to towns nearby. Conversely, you may not wish to mention that at all if you’re press release is travelling further afield. Know your product, tell them why the people involved had the unique perspective that created it. Now, at the very bottom, you want to make sure the reader has links to whatever forms of contact or websites you’re on. It’s also a good idea to reiterate the main points of your document. Buy my album! That’s what I’m saying here (feel it filter into your subconscious) I’m also taking the opportunity to feed them any links I may want them to visit. Keep it straightforward and to the point. The name; ‘one sheet’ is literal to that degree. So there you have it, a quick breakdown of what went into my one sheet. Remember there are no strict rules as to how it should look but in order for it to be effective, you want to make it eye catching and to the point. Don’t make the reader have to hunt for any info. For every twenty you send out, only one or two may get you anything, so don’t be disheartened. It’s also often hard to tell whether you’ve had any response at all, so just keep sending them out and see what happens. 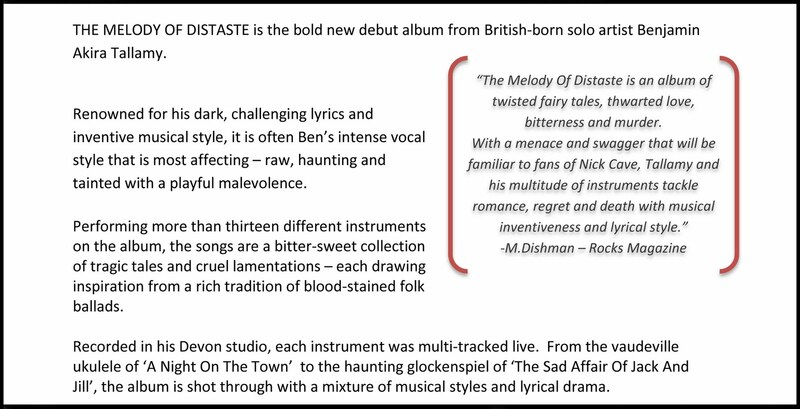 If you visit my web page for my album; The Melody Of Distaste, I will slowly put up any reviews I received and where applicable, link to the sites that were responsible. Please feel free to submit your own music to them as well – if they reviewed me then they must be open to submissions! Also, please share this article with as many musicians as you can – no one should be charged for this information. Obviously, it’s great if you visit my site etc, blah, blah, blah, but I spent many hours sifting through countless pages of bollox before piecing together what I was doing. I hope this will save you that misfortune! Anyway, as always, feel free to comment if anything isn’t clear.